Imagine!’s Out & About department, which provides recreational services to individuals with intellectual and developmental disabilities living in Boulder and Broomfield counties, is hosting a “Bike Block Party” at Superior’s Purple Park on August 13 from 11:30-2:30. 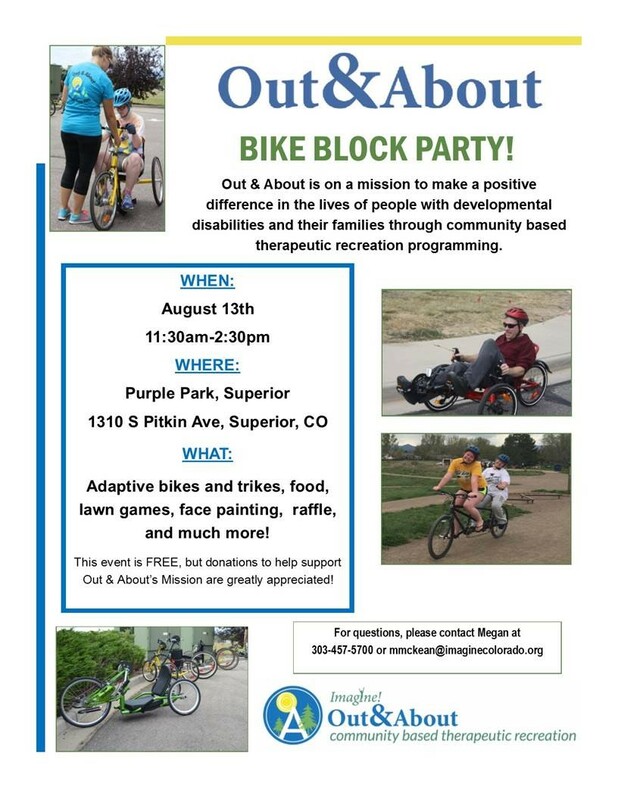 The purpose of the Bike Block Party is to introduce the community to the many biking options that exist for people with a variety of disabilities. Some of their partners for this event include the National Sports Center for the Disabled (who are providing a number of hand-cycles), Rocky Mountain Recumbents (who are providing a number of recumbent cycles), and Strider Bike (who are providing a variety of Balance Bikes). In addition to opportunities for people to take test rides on the bikes, there will food, lawn games, face painting, and much more. There is no charge to attend, but donations are welcomed. I hope you can attend. I believe it will be a great example of our community coming together to support recreation options for all of our citizens.